ABOUT THE BOOK Are you disappointed with dumbed-down reading material ("twaddle") written for children? Do you wish for your children to feast their hearts and minds on noble ideas, fine art, and great literature? Are you hoping your children gain an appreciation of nature and a deep understanding of natural sciences? Most importantly, do you want your children to develop a lifetime love of learning? If you answered "yes," you may discover a Charlotte Mason-inspired twaddle-free education is just what you've been looking for. A Twaddle-Free Education is intended to be a simple introduction to Charlotte Mason's ideas for those either unfamiliar with or new to Charlotte Mason's methods. It can also serve as a quick refresher and encouragement for current Charlotte Mason home educators. Charlotte Mason was a British educator from the last century whose ideas are currently experiencing a renewal among home educators and private schools throughout the world. A Twaddle-Free Education is a long time Charlotte Mason home educator's personal experiences and thoughts on applying a Charlotte Mason-style education simply and naturally in a modern American home school setting. ABOUT THE AUTHOR In the mid-1990's, Deborah Taylor-Hough set up one of the first Charlotte Mason homeschooling websites and edited The Charlotte Mason Monthly newsletter. Debi currently edits The Charlotte Mason eMagazine and blogs at CharlotteMasonHome.com CONTENTS INCLUDE: My Introduction to Charlotte Mason Charlotte Mason in a Nutshell Narration Tips Natural Nature Learning Homeschooling with a Rock Bottom Budget Scheduling a Charlotte Mason-style Homeschooling Day Twaddle-Free Literature by Grade Level Frugal Family Field Trips Twaddle-Free Holidays Interview with the Author Are All Homeschooling Methods Created Equal? ... and more! 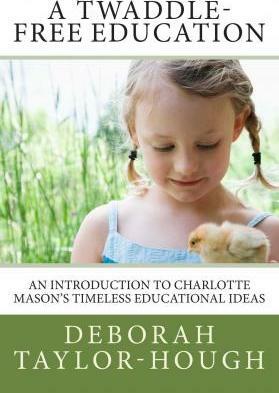 A Twaddle-Free Education: An Introduction to Charlotte Mason's Timeless Educational Ideas, is available in both paperback and Kindle ebook formats.